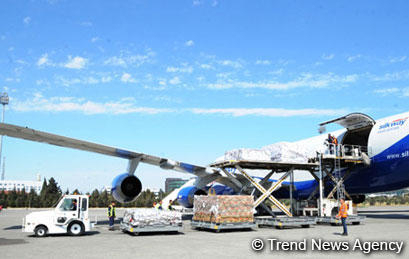 Humanitarian aid sent to Iran April 10 on the instructions by Azerbaijani President Ilham Aliyev has been delivered to this country, Azvision.az reports with reference to Azerbaijan’s Ministry of Emergency Situations. The humanitarian aid includes 75 tents, 150 water pumps of various parameters, 5 rubber boats, 140 units of uniform, 320 sets of clothes for lifeguards and 200 life jackets, 2 excavators, 166 kitchen sets, 3,000 bed sets for a total of 950,000 manats. On the instructions by Azerbaijani President Ilham Aliyev, on behalf of the country’s government, the Ministry for Emergency Situations sent humanitarian aid to Iran in connection with natural disaster in the country as a result of continuous rain.